Moisturizes the eye contour; Leaves wrinkles and fine lines more filled; Increases the firmness of the skin around the eyes. 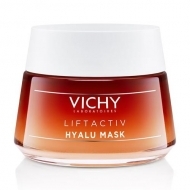 DESCRIPTION: Liftactiv Micro Hyalu Eye Patches from Vichy are patches for eyes with unique micro-cones patented technology that diffuses in the epidermis of the skin for an anti age effect and transformation of the contour of the eyes. 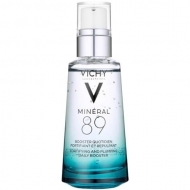 This product is composed of pure low molecular weight Hyaluronic Acid for an eye contour transformation in just 1 night. The cones dissolve in the epidermis to fill the fine lines and revitalize the eye contour allowing quick and efficient results. Remove the protective films from the patches and apply on clean and dry skin at a comfortable distance from the lower eyelash line. Once applied, give small touches repeatedly and gently using your fingertips to optimize the dissolution process and let it act all night. When waking up, remove carefully, moving from the inner corner of the eye to the outside. 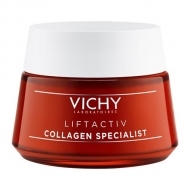 For firmer skin use for 5 nights.